Central Auckland’s Pacific Island Presbyterian Church in Newton (PIPC) is being treated to a facelift thanks to a group of dedicated painting and decorating students from Aspire2 Trades. From today, up to 20 Level 3 painting students will be honing their newly-learned skills painting the interior of the Church’s two halls, to ensure it looks spick-and-span for its upcoming 70th birthday celebrations in November. PIPC Session Clerk Mosotele Seta Efaraimo couldn’t be happier. “I recently took over as session clerk of the Church and it has also coincided with our 70th year. I have been working on trying to spruce up the Church and our facilities as we will be having a bit of celebration in November. The Aspire2 Trades project will go a long way towards getting the Church ready for the festivities,” he says. Seta contacted Aspire2 Trades after hearing that its students were volunteering their time and expertise to paint a South Auckland marae. The students, and their painting and decorating tutor Dianne Collier were happy to offer this free service to the Pacific Island Presbyterian Church as well. Says Dianne: “We love opportunities to give back to the community. 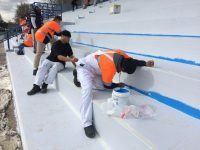 Aspire2 Trades has been delivering painting and decorating training for a little over a year, and already our students have painted the interior of the Manurewa Marae, the Manurewa Memorial Park Grandstand, and we are part way through painting the exterior of the Papakura Marae. All painting work is completed to a high standard, as students work under the watchful and experienced eye of their painting and decorating tutor. The PIPC project is estimated to take approximately six weeks, with students dedicating two days each week to the job.